The learning in this series of International baking for me is immense. Researching various food cultures has been an eye opening exercise. There are so many similarities across different cultures that sometimes it is unbelievable. But still there are some which are unique to each culture. As per my observation, the traditional Russian Breads are all in some way or the other braided with or without any filling. I came across this recipe in which the lady describes her grandma's recipe of this bread and about how proud her grandma would be to know that this traditional bread has been made popular. We love citrus flavors in our bakes and so this shouldn't come as a surprise when I say "This has been one of the best breads I have baked in this series". In warm milk add a teaspoon of sugar and active dry yeast and set aside in a warm place for the yeast to froth up. In a stand mixer bowl, add flour, sugar, salt, butter, yogurt and the yeast mixture. Knead for about 10-12 minutes until the dough is soft and elastic. If it is sticky, add a teaspoon of flour at a time making sure the dough is not stiff. Place the dough in an oiled bowl, cover and set aside in a warm place for the yeast to work its magic. [around 90 minutes]. Meanwhile make the cheese filling by mixing all the ingredients listed under 'For the filling'. Set aside. Deflate the dough and on a floured surface, roll it into a 9 inch X 6 inch rectangle. Place the rectangle on a lined baking tray. Preheat the oven to 360 °F. 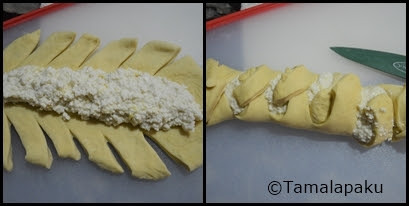 Place the braided and filled dough in the oven and bake for about 25-30 minutes until the bread is golden brown all over. Remove and allow it to cool before slicing. Makes a 9 inch braided bread. Cheese and lemon filling , thats really very amazing, bread looks absolutely beautiful and fabulous. Another beauty Harini ! Filling sounds delicious and the bread looks awesome , would love to taste it . That filling so neatly tucked into the bread, yummy! It sounds and looks delicious, lovely braid. This marathon has been an eye opener indeed, amusing similarities in cuisines and dishes around the world. Lemon and paneer sound fabulous together. The bread looks awesome. I have to try this asap! So glad this exercise has been so useful!..love how nicely your bread has been baked!..wonderful choice! That bread looks amazing. I love your Indianized filling idea. Cheese lemon filled bread sounds interesting and it has got this beautiful shape too. Lemon and cheese....I am imagining how the flavors would have turned out. I am tempted to try this. Looks wonderful as a dessert bread or with a glass of wine.